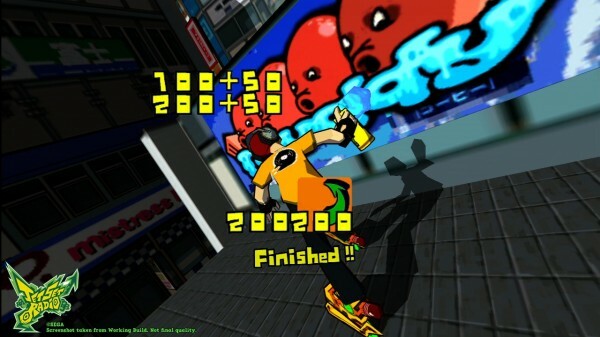 Despite the fact that it was released twelve years ago, and was designed for a system that is considered archaic by today's standards, Jet Set Radio is definitely worth a purchase in its made-over state. It's creative, quirky, surreal and, most of all, enjoyable, despite having a few issues. 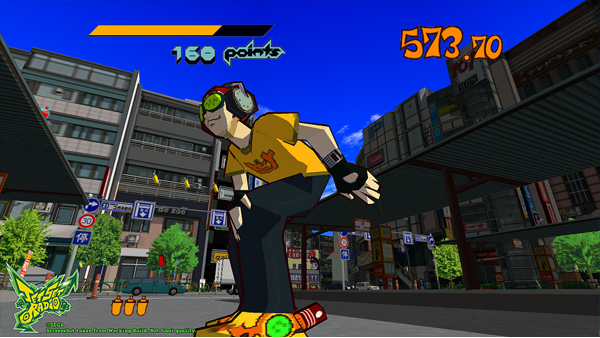 Over a decade ago, a creative and somewhat surreal game known as Jet Set Radio debuted on SEGA’s Dreamcast. Originally referred to as Jet Grind Radio here on our North American shores, the title received a lot of buzz for its innovative cel-shaded visual style, phenomenal soundtrack and short burst appeal, eventually becoming one of the console’s most talked-about releases. As a result, it’s not surprising that the Japanese gaming giant decided to revisit its past success, choosing to give the classic a high-definition makeover, in order to position it for a re-release on both Xbox LIVE Arcade and the PlayStation Network. For those who aren’t familiar with the series, Jet Set Radio is a quirky title that borrows elements from the action, platforming and extreme sports genres, though its main focus is not on performing visceral tricks in exchange for an assortment of in-game points. Instead, its story and gameplay elements centre upon a brewing gang war in a fictional representation of Tokyo, as well as an additional, stand-alone region. Yes, the combination of above-mentioned descriptors creates a weird concoction, but that’s where a lot of the game’s charm lies. You see, it’s not about hitting or killing rivals; instead, one must tag them and/or their graffiti in order to become victorious. As a result, most of the game has players taking one selected avatar (picked from the GG gang’s roster) through colourful environments, which they must claim as their own property. However, there are other level types, including one where the player must defeat foes by spraying them with ten spurts of paint each, as well as an assortment of rival skill challenges. For the most part, the first one to two hundred seconds of each timed graffiti takeover stage provides respite from danger. However, it doesn’t last for long. Once a certain amount of tags have been painted over, pandemonium tends to break loose. During the early portion of the three chapter-long campaign, that specific term describes enemy police officers and their gun-toting captain, who never thinks twice about shooting the skaters that get in his way. Staying away from those goons can be tough, but it never becomes overwhelming, though that cannot be said about most of the game’s other enemy types. Rocket-emitting helicopters, jetpack-wearing soldiers and flamethrower-using soldiers all appear in order to make your job a nightmare. Quite often, those specific foes became annoying, but plenty of health pick-ups were made available during their featured stages. Now that we’ve discussed the GG gang and its motives, it’s important to talk about how Jet Set Radio‘s pivotal painting mechanics work though, thankfully, they’re quite straightforward. Cans of spray paint dot each landscape, and they’re automatically added into the avatar’s inventory whenever he or she touches them. The amount that can be held at one time differs between characters, and the easiest way to fill up is to pick up a blue can as opposed to a standard orange one. The default pick-ups only allow for one spray, while the dark blue ones can be used several times. Conversely, the colour red is indicative of a health replenishing-canister. Like the paint itself, each tag is assigned a hidden numerical value based on its size. Small spots only require you to use one can of paint, and only take a second to cover, while medium and large tags take some effort. As a result, one must stop in front of them instead of simply sliding past them, which can result in lost health if enemies are nearby. Thankfully, you can lose angry enemies by following blue arrows, but countdown clocks nearing zero don’t allow for that sort of reprieve. For that reason, I’m glad that Jet Set Radio‘s development team decided to implement an input pattern for all medium and large tag attempts to follow. It starts off with a downward motion using the left joystick, then quickly evolves into circular motions, with failure resulting in the loss of a paint can. 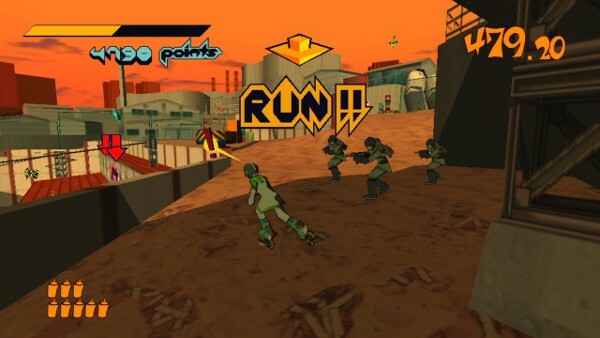 Although the above descriptors may have painted Jet Set Radio as a convoluted gaming experience, that isn’t the case. It has a set of rules that must be followed, but is an experience that is rather easy to pick up and play. None of the included campaign levels are overly long, and grinding on rails or pulling off jump-enabled tricks ends up being a piece of cake after a bit of practice. However, it is important to note that there are control issues to be found within this revamped digital download, as it happens to lack the flow that other extreme sports series offer, and is somewhat clunky for that reason. That stiffness ended up being the cause of some missed grinds and a few bouts of frustration during my review sessions. Despite the fact that twelve years have passed since this creative, quirky and much talked-about game launched onto SEGA’s three-dimensional Dreamcast, I had never played it until this very week. Now that I have (finally) completed its entire campaign, and in stunning high-definition, I can honestly state that I’ve never played another game like this one. Jet Set Radio is almost surreal, but in a good way, and there’s no shortage of creativity to be found within. It didn’t draw me in right away, but it grew on me over the course of two to three hours, and I eventually became engrossed by it. When you consider that the bones of this project are well over a decade old, it’s unrealistic to expect an experience that is as fluid as something released in 2012. For that reason, I went in with appropriate expectations. That made some of the title’s technical concessions – including its occasional frame rate hiccups, imprecise controls and infuriating final boss – easier to overlook. However, it was strange to see the low quality textures that were kept for certain enemies’ faces, making them look both fuzzy and incredibly dated. Thankfully, the rest of this revamp’s aesthetics popped in HD, mainly because the core game was so colourful, providing a great canvas for today’s high-definition resolutions to exploit. Complementing the game’s trademark visual style is its returning soundtrack, which features some incredible music, including Rob Zombie’s famous Dragula. The included tracks are interchanged throughout each level, and each one is incredibly loud. Even though the in-game volume slider wasn’t at its full capacity, loud music flooded the room in which I was playing, though I didn’t mind because the music was simply fantastic. Where the boisterous sound level did become an issue, however, was during cutscenes featuring the in-game radio station’s DJ. It seems as if SEGA decided not to re-do his unusual voice work, choosing to stick with the original, low quality, recordings. As a result, whenever it was his turn to speak, lowering my selected volume level became a priority, in order to lessen the audible cracking that his lines included. Despite the fact that it was released twelve years ago, and was designed for a system that is considered archaic by today’s standards, Jet Set Radio is definitely worth a purchase in its made-over state. It’s creative, quirky, surreal and, most of all, enjoyable, despite having a few issues. Even though I didn’t go in with any nostalgic memories of its original form, it offered an experience that I will never forget, and will surely go back to.